Green lenses and lights are used after sunset to increase fishing activity in the water. Without the robust lighting accessories, one would be left to fish in overwhelming mystery and darkness. 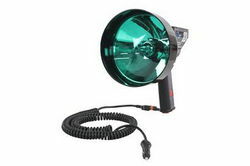 The explanation behind the practice of using green light starts with attracting plankton and bait-fish around the hull of the boat. Green light supports one of the shortest wavelengths in the visible spectrum at 495-570 nm, allowing it to penetrate water efficiently before scattering. When plankton sees the light, it swims towards the source. The creatures are naturally drawn to the light due to reproduction. In particular, green light is the most efficient type of light that can facilitate such activities. Bait-fish, shrimp, squid and other small swimmers chase the plankton, causing a chain reaction of feeders to gather around the area. If done correctly, predatory fish will eventually come close to feed around the active location. For clear water, such as oceans, blue light is very effective in attracting some types of bait-fish. The advantages of using blue light includes greater water penetration (since blue and green light have shorter wavelengths, compared to white light) and brighter appearance. One should carefully note that blue light is mostly used in saltwater conditions, while green light is applicable to fresh bodies of water. Floating fish lights, submersible fishing lights and black lights are the three most common fixtures used for night fishing. For attracting fish, floating and submersible fishing lights are applied. Black lights are mainly used for guidance when illuminating a fishing line. There are several pointers to consider when utilizing green lenses for fishing. First, the boat must be anchored to attract fish; because plankton and bait-fish have to be able to gather around the light. Drifting or moving slowly will force the micro swimmers to chase the light. If bait-fish does not appear after 30 minutes of illumination, move to another location. Ideally, the fixtures should only be used outside of the vessel, with the light slightly submerged to attract more bait-fish, and increase visibility in the water. It is not advisable to shine light from the bottom, pointing upwards to the surface of the lake. Instead, depths up to three feet is sufficient for attracting bait-fish. Lastly, a configuration of two fixtures with green lenses, separated by three to four feet of space, is recommended to maximize the radius of the light. This would allow more people to fish at different parts of the light (one light is effective for small boats). When fishing, start from the outer edge of the light to avoid easily excited fish swimming directly in front of the bright beam.